OMG! That’s my first thought when it comes to this book. I was drawn in just by the title. Wow! Thirteen husbands? What would cause someone to marry thirteen times? Not once or twice, but thirteen times. Sounds like a habitual bride to me. Did she get divorced from all thirteen husbands? Was she in love with the idea of being married? The plot twists and turns of this book will have you thoroughly entertained. I was practically sitting on the edge of my chair as I read this book. I was anxious to find out what happened next. I wondered what would make someone get married thirteen different times to thirteen different men. They were all different ages, races, and worked different occupations. Some of the deaths resulted in hefty insurance payouts that made the widow a wealthy woman. What in the world? Ivy Raye was the lucky recipient of these thirteen husbands. The previous twelve marriages ended badly, so she was determined to make her thirteenth one last. How did she know that it was beyond her control? You see, all twelve of her previous husbands died from mysterious circumstances, freak accidents, and one even died from suicide. In all the different scenarios, Ivy was never a suspect. She was just deemed a very unlucky bride. As her husband’s kept dying, Ivy would pick up and move somewhere else with a new identity and a new husband. As the story progressed, it was revealed that Ivy’s mother had a hand in the deaths of Ivy’s husbands. She didn’t actually commit the crimes, but she orchestrated each and every one of them. She wanted her daughter to be happy, so if a husband wasn’t treating Ivy right, they mysteriously died. Wherever Ivy moved to, her mother was there along with her. The two were as close as close could be. When Ivy married her thirteenth husband, she thought they would be together forever, but someone else had different plans. Mysterious things started happening to Ivy’s husband. Someone was trying to kill him. Ivy’s mother swears that she has no part in trying to kill Ivy’s husband, so she is left stumped as to who would want her husband dead. During her mission to find who is trying to kill her husband, Ivy is reminded daily of her past. Someone is out to get her, and they won’t stop until her secrets are exposed. Ivy is harassed and taunted by someone claiming to know her past. They do whatever they can to scare her into admitting that she killed her previous husbands. Well, she actually did not have anything to do with their deaths, but she knew who did, and she refused to give up her mother. During all of this, Ivy finds out some long buried secrets about her mother that puts everything into perspective. There is a reason that she is so determined to protect her daughter at any cost. Even if it meant murder. Finally tired of the harassment, Ivy gets the police involved to help her solve the mystery behind who is after her husband. Little does she know, the police are secretly trying to build a case against her. They know all about her previous twelve husbands and the mysterious ways they died. They even nick-named her, the Black Widow. They want to catch her in the act of killing her thirteenth husband. Nearing the end of this roller-coaster ride of Ivy’s life, she finds out that the people that she surrounded herself with aren’t really who they portray themselves to be. Her best friend, her husband, and even the police are all out to get her. It is all a conspiracy to catch, the Black Widow. They are willing to put everything on the line to catch Ivy. They don’t care what they have to do to do it. People are murdered and lies are told, all in the name of seeking justice. But in the end, all the cards are laid out on the table, and Ivy finds out just who has it in for her even more than the police does. Her past smacks her dead in the face when one of her husbands, who is supposed to be dead resurfaces. What a tale. This book is one of my favorites. It will have you second-guessing the people you think you know so well. No one in this book is who they say they are, including Ivy herself. B. M. Hardin knows how to keep the reader engaged with this jaw-dropping, drama-filled story. This should be made into a Lifetime movie. I wish I could give this book ten stars, but five is the most I can do. This book will definitely keep you wanting more. Just because I read this book, I have now become a fan of B. M. Hardin. I have read several more books by her, and they are just as good as this one. 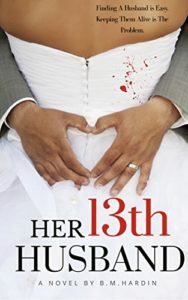 If you’re looking for a good book to sink your teeth into, check out, Her Thirteenth Husband. You won’t be disappointed. Maybe you’ll become a fan just as I have.